The strongest of Frederick Delius’s six operas has not, to my knowledge, been seen on a professional British stage for half a century (a planned Royal Opera production three years ago was sadly ditched following the death of Charles Mackerras, though there was a concert presentation at the Southbank Centre in 2012). But A Village Romeo and Juliet is gaining a following in German-speaking countries, not least, it would appear, thanks to its source in a novella by the 19th-century Swiss writer Gottfried Keller. 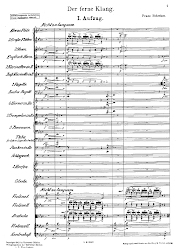 And it did indeed receive its world premiere, in Jelka Delius’s German translation, in Berlin in 1907. It was staged in Karlsruhe two years ago and is scheduled in Bielefeld for next January. 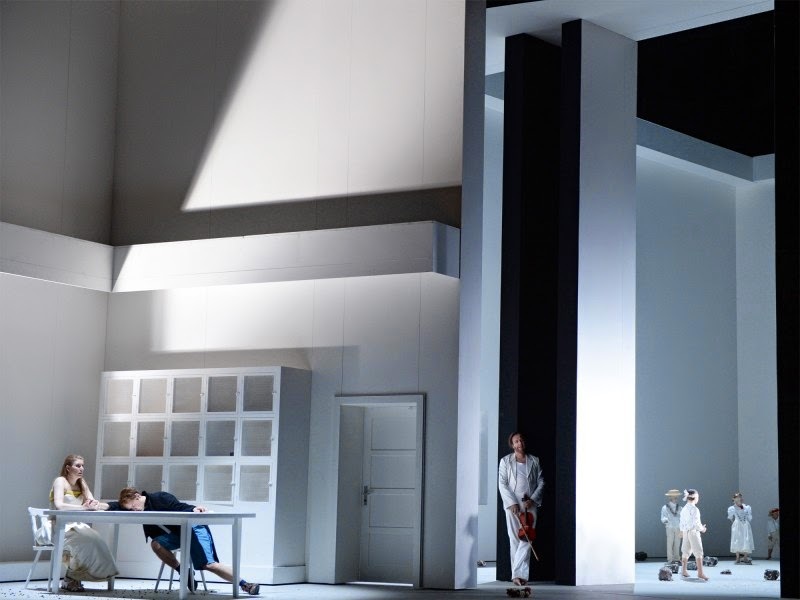 Coming in between the two, this Frankfurt debut for the work could be seen as its final coming of age: playing to full houses and receiving the complete Regietheater treatment in such a major house it gave the sense of having at last achieved acceptance and esteem as a stage work. Certainly no expense seemed to have been spared in its presentation. Christian Schmidt’s monumental set was an almost constantly mobile trio of three-dimensional structures that must have required some nifty computer-aided mechanics to choreograph in time with the music and action. Such scenic fluidity meant that the opera could be performed without a break and so maintain the musical and dramatic tension over its hour-and-three-quarter span. This setting was strangely interior – even, with its apartment-block staircase, urban – for a work in which nature plays such an important role, both scenically and in the music, and the farming context of the plot seemed deliberately alien. The only natural feature was a live caged rabbit in the first scene – no doubt symbolic, and later (dead and stiff) doubling as the Fiddler’s violin and inexplicably reappearing in cartoon-style human form towards the end. This baffling intrusion went against the generally understandable tenor of Eva-Maria Höckmayr’s interpretation, one where one didn’t even miss the imagery of the final scene where the two young lovers are supposed to float away on a sinking hay barge – here their fatal consumption of a cocktail of drugs made for just as poignant a close. On the face of it, the story of the opera is a simple one: two children, offspring of two farmers who have long been in dispute over a parcel of land, meet again as teenagers, fall headlong in love and given their situation and the poverty that their fathers’ rivalry has brought upon their families see the only way out in death. The genius of Höckmayr’s concept of the opera was to people the stage almost constantly with doppelgängers of the two lovers at different times of their lives, from young children to the never-to-be-reached old age. The effect was an almost surreal obsession with the inseparability of Sali and Vreli and the pursuit of their impossible union, epitomised by the scene in which they both dream of their wedding and the brides and bridegrooms proliferate. The dreamlike nature of the conception was taken a step further in the staging of the ‘Walk to the Paradise Garden’ interlude before the final scene. What on face value is supposed to be a rather forlorn amble to the pub to escape the abuse from the villagers at the fair was turned into a vision of Eden itself in which two more young Sali/Vreli lookalikes removed all their clothes, stood in composed embrace and then faced the audience in all their vulnerability like the pre-temptation Adam and Eve. As an idealised counterpart to the sexual awakening that was hinted at on another part of the stage by two more extras, it was profound, beautiful and heart-rending all at the same time, and Delius’s soaring lines in the purely orchestral arrangement of his ‘Walk’ will never sound the same to these ears again. Like the ‘original’ Romeo and Juliet, Delius’s characters are assumed to be in their mid-teens, a difficult age to cast plausibly. 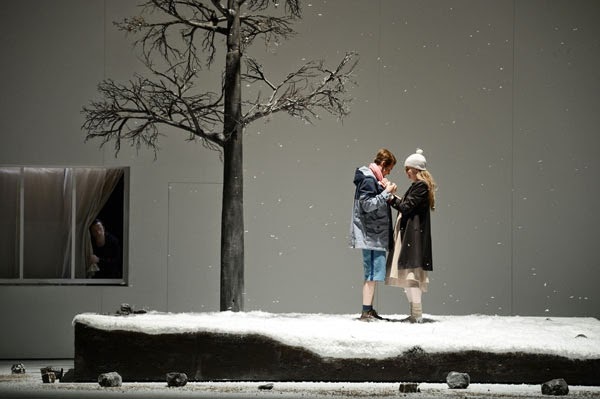 But Finnish tenor Jussi Myllys and American soprano Amanda Majeski both looked feasibly youthful and sang their roles with convincing ardour and portrayed their characters’ enveloping mutual attraction most affectingly. Their younger selves were also sung with confidence by two members of the house’s Children’s Chorus, Ludwig Höfle and Chiara Bäuml. Höckmayr and her designers did little to distinguish between the two farmers, Manz and Marti, as if to emphasises their joint culpability in affairs, but Dietrich Volle and Magnús Baldvinsson were contrasted enough in voice to give them some sense of humanity and vulnerability. Apart from the two farmers, the main subsidiary character is the Dark Fiddler, who appears three times through the opera to suggest ways out to the lovers that ultimately they refuse to take. Here, as played by Johannes Martin Kränzle – the Beckmesser and Alberich de nos jours – he was on stage almost throughout, and paradoxically dressed all in white, as a kind of orchestrator of the action – whether malign or benign was often deliberately unclear. In one sense it was a shame that a singer of such charismatic power and richness of vocal communication only had three ballad-like ‘arias’ to sing, but his stage presence, whether sidling in through windows or providing the model of a tree to complete the Eden image, was all-pervasive – and what’s more he even played his own violin solo, quite creditably, in his first scene. Delius’s original English libretto sounds horribly effete and dated to 21st-century ears, so it was a relief that it was sung here in Tom Hammond’s revision, originally made for the Delius Centenary Festival staging by Sadler’s Wells in 1962. On CD, Delius’s score has often come across to me as rather overly rhapsodic, despite the strength of its main, opening motif and the obvious glories of the ‘Walk’. But seeing and hearing the whole thing in the theatre for the first time changed my view completely and its searing, heartfelt lyricism and Romantic sweep completely consumed the senses. Much of this was down to the conducting of experienced Delian Paul Daniel, who seemed to have convinced the members of the Frankfurt Opera orchestra that this glowing, febrile score is one of the masterpieces of early 20th-century repertoire. So glad you are writing this site! (Can't remember if I told you how many hours I spent at New York's Metropolitan when I lived there.) Is there a subscribe button that I don't find? And of course, thank you for the link. Thanks, Susan! Have added a 'follow by email' button now.